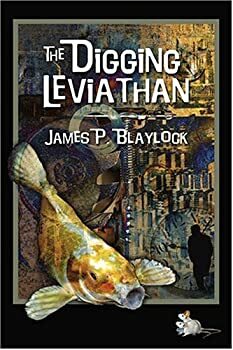 The Digging Leviathan is the first book in James P. Blaylock’s LANGDON ST. IVES/NARBONDO series. I’ve been reading these out of order, which doesn’t seem to matter. The books have some overlapping characters, settings, and/or concepts, but each stands alone. The Digging Leviathan features two teenage boys, Jim Hastings and Giles Peach, who are living on the coast of Southern California during the mid-20th century. Each is a dreamer and each has his own “issues” involving his father. Jim lives with his uncle Edward St. Ives (who, I’m assuming, is a direct descendant of Langdon St. Ives, the eccentric Victorian scientist who stars in several of the books in this series) because Jim’s mother is dead and his father is insane. (Or is he?) Most of the time Jim’s father lives in a mental hospital, but when he manages to escape (a regular occurrence), he comes home until Dr. Hilario Frosticus (one of Dr. Narbondo’s incarnations, I presume) manages to find him and take him away again. While at home, Jim’s dad oversees animal experiments which he hopes will support his peculiar theories about evolution and civilization. He’s also trying to get a short story published in Analog. Giles’ father, on the other hand, has been missing for years. Giles, who has webbed fingers and a set of gills on his neck, suspects that his dad turned into a fish and swam down a subterranean aquatic tunnel which leads to the center of the earth. Desperately trying to find his father, Giles is building a tunneling machine called The Digging Leviathan. Jim doesn’t believe Giles, of course. He thinks Giles gets his bizarre ideas from all the Edgar Rice Burroughs and Jules Verne novels he reads. But, strangely, other men are interested in Giles’ plans. Some hope to use Giles’ machine to discover the secret to immortality. Some are afraid that Giles will destroy the earth. Do they have some reason to believe that Giles is on to something? What I’ve described is the essential plot of The Digging Leviathan, but readers who are familiar with James P. Blaylock won’t be surprised to be told that it doesn’t seem like this book was written for the main purpose of telling a story about tunneling to the center of the earth. Instead, Blaylock uses the plot as an excuse to entertain us with the antics of his quirky but loveable characters and, perhaps, to touch our hearts as we watch two boys longing for a “normal” relationship with their fathers. Blaylock’s funniest character is Jim’s father who seems like (but maybe isn’t) a paranoid schizophrenic. He believes that his neighbor — a little old lady in curlers and a bathrobe — is conspiring against him with the gardener. He imagines that every night they hoist her dog over the fence so it can defecate in the Hastings’ yard. He also suspects that the man who drives the ice cream truck is a spy. In the backyard shed, Jim’s father attempts to breed mice and axolotls, hoping he can get the mice to devolve into an aquatic species. He dresses them in doll clothes to test his Civilization Theory. Mr. Hastings’ ideas are funny to consider and Blaylock gets to send escaped dressed-up axolotls running through some of his scenes. Hilarious! Creating and entertaining us with his neurotic characters is what Blaylock does best. As if they’re in a Monty Python sketch, they’re constantly (and I’m taking these verbs right out of the story) dashing, springing, jumping, cursing, tripping, lurching, falling, stumbling, spying, sneaking, creeping, lurking, and peering in windows. Readers who love John Cleese’s brand of humor will probably be delighted with The Digging Leviathan (and the other LANGDON ST. IVES books). Readers who don’t, probably won’t. I do love Blaylock’s sense of humor, though I have to say that the silliness goes on a little too long in several scenes of The Digging Leviathan. There’s more to The Digging Leviathan than the quirkiness I’ve described. The story is also about familial love. It was the loss of Jim’s mother that probably sent his father over the edge. The bond that Jim and his father still have, and Giles’ desire to find his own father, is sweet and poignant. I listened to Audible Studio’s version of The Digging Leviathan. It’s 10.5 hours long and performed by Christopher Ragland, who obviously gets Blaylock’s brand of humor. I enjoyed his performance, and I thought it got better and better as it went on. This is one of the books discussed by David Pringle in his great overview volume “Modern Fantasy: The 100 Best Novels.” I’ve been meaning to read this Blaylock book for years. Thanks for the reminder, Kat! Oh, that’s interesting Sandy. I would like to read what Pringle says about the book. And if you read it, please let me know what you think. It’s quite silly sometimes and I imagine that many readers just won’t appreciate that.